As you can see my partner Zeke and I have traveled to our mine to get some more Kosher Coke. Yes it is that time of the year once again when you can buy Coca Cola made without High Fructose Corn Syrup. So mount up and find a nice Jewish area grocery store so that you can plunder their stocks. 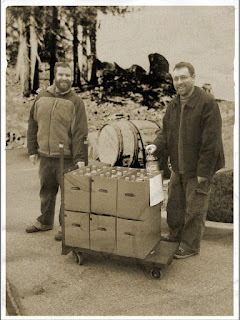 The photo was taken yesterday but as we wheeled our bottles out I could not help feel like we were packing up the donkeys for a long ride into the mountains. If you are confused by the whole HFC thing then check here.